I-90 Seed Solutions customer Mark Lenz is the 2013 winner of Monsanto’s “Americas Farmers Grow Rural Communities” program. In this program farmers can nominate a local non-profit organization for a $2500 grant. One non-profit in each county is selected to receive the award. 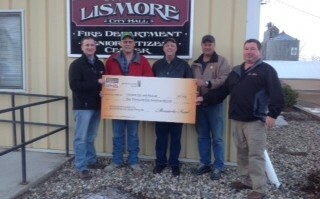 Mark nominated the Lismore Fire Department for the grant, and they were selected as winners. Congratulations to Mark Lenz and the Lismore Fire Department!